Just this past April, it was the celebration of Malbec grape. Many folks are not familiar with the grape, other than they know they like it, and they see much of imported from Argentina. The long and short of it, the grape mostly originated in the Bordeaux region of France, where it's one of the five grapes allowed to be blended in red wines produced there. Some will undoubtedly argue, no, no, it hails from Cahors, France, Malbec's 'real' ancestral home and goes by a couple other names there, Côt and Auxerrois. The styles from Cahors is typically much leaner, rustic and abundantly tannic, compared its Argentine counterpart, which is typically, rich, lush, and what some would even call opulent. There's much truth to support that assertion, from the experiences I've had with this varietal I'd say that assessment is spot on in general. While the Malbec grape may have French heritage, I'd suggest, it has evolved, now sporting Argentine soul. I've still not made a trip down to Mendoza, tho it remains high on the bucket list of wine regions I simply must visit. I was sent multiple samples of Malbec last month, but I felt, that these two, from Graffigna, deserved a place in the review spotlight. While the others were, mostly meh, I did, however, find one, I really dug, and it will be written up in a later post. The Enology/Viticulture Program I'm taking, coupled with work, eats up much my free time. That said, writing reviews can sometimes take a backburner, part of the reason I only accept a few selected samples. 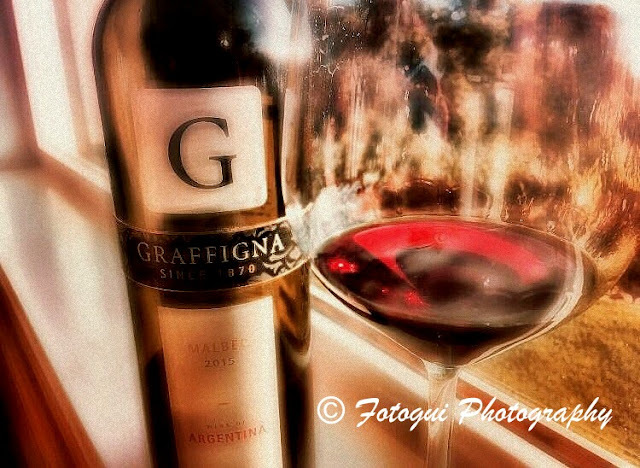 Today's focus is on Graffigna, they have been making wine since 1870 when Italian immigrants came to Argentina looking for a fresh start in the New World. That immigrant was Santiago Graffigna, who started with a dream of making wine for locals to consume, he soon realized it was time to show the rest of the world what Argentina Wine was all about and wine empire was born. Today production levels on many of their wines help them get in the door to many chain store locations, coast to coast, so they, as a brand are very well known to the average vino-sapiens. 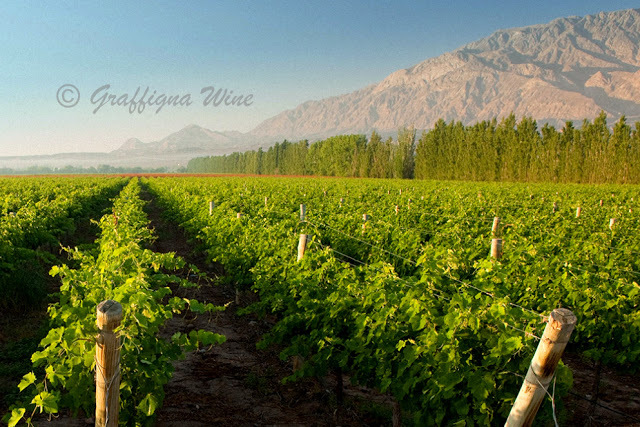 While the best-known Malbec producing regions are found in Mendoza, Graffigna is located in San Juan, almost parallel to the north of Mendoza. I borrowed an image from their site, via screenshot, appropriately credited to them of course, giving you a small glimpse of the dynamic terroir to be found here.This summer with grills working over, it is a great time to give some of their wines a swirl, trust me you'll be glad you did, both the wines in today's review, are excellent food wines, the less expensive choice more so than the other. But that said, you'll definitely want to give a local food pairing favorite a swirl, Empanada Salteña. It's a perfect match with both wines, just click the link for the full recipe. 2015 Graffigna Malbec: One hundred Malbec, and a one hundred percent fantastic wine. It is light in color, a bright ruby colored core, aromas of dark summer plum, blueberry, sage, and broken, crushed rock. The taste is dry, the acid is very balanced, the body is medium and the tannins moderate. A generous wine that drinks well right from the first pull of the cork. The palate is plush, fruit-forward, but you can taste the terroir of the mountain fruit. There's plenty going on here, bright cherry, dark plum, crushed peppercorns, toasty vanilla notes in the background. A robust wine for a small price. The Score: 90 points. Highly Recommended, everyday drinker. Santiago Graffigna 2014: A blend of Malbec, Cabernet Sauvignon and surprisingly Shiraz. As you can see from the image, the label needs to be corrected with a sticker over what most likely said 2013. Oops, mistakes happen, but I bet whoever made that error, has not lived it down. This wine, which is a statement of the possibility of their selected vineyard blocks from the Pedernal Valley in San Juan, needed a decant, to unlock its tremendous heft. While this wine is just a baby, in my opinion, many years of cellaring will reward the patient, as it develops to its full potential. It's just now starting to develop its full character. A premium barrel regiment of French [85%] and the balance of American Oak for 18 months. In the glass, wonderful intensity, a shimmering violet inkwell core. The wine was gorgeous, as I poured it into the decanter. Clarity wise, it was near opaque, but I could still see my finger underneath. Aromas are fragrant, blueberries, bright cherries, trail dust bouncing from the glass. On the palate, this wine is dry, the acid to fruit ratio is spot on, medium to full-bodied, and elegant tannins. The flavors are plush, finely knit tannins, crushed blueberries, dark cherry, spices, notes of vanilla and toast. The finish is long, but not lingering. A delightful wine. The Score: 92 Points. Highly Recommend. Full Disclosure: The wines in this article were sent as 'samples' for the review process. Wine Scores: Love Them, Hate Them, Here to Stay? Wine Marketing: Who is Zooming Who?